As always, after Christmas is over, I found out about some more Christmas 45s being released, that I hadn't learned about before Christmas. In this post, I've listed seven too-late-for-Christmas-2017 45s. Let's start with some 45s released in Japan. While in many countries it looks like the 7" format is getting less and less popular - unfortunately, I would say - it looks like Japan is the only exception. A lot of music is being released in Japan on 7", mainly reissues of J-pop artists, but also new songs by Japanese artists and songs by artists from outside of Japan. In 2017, five Christmas or seasonal 45s were released in Japan, not counting the Japanese edition of The Beatles Christmas singles box set. Previously, I've already written about the 7"'s of Kindan No Tasūketsu and Shun Ishiwaka. Here, I will introduce three more Japanese 7"'s to you - those of Maki Nomiya, Sunny Day Service and Three Berry Icecream featuring Brent Kenji. Before Maki Nomiya started her solo career, she was the singer of Pizzicato Five, one of the most succesful Japanese popgroups of the late 20th and early 21st century. Pizzicato Five was known for their mixture of J-pop, jazz, dance and lounge, and was an important pioneer of the Japanese music style Shibuya-kei, named after a hip area of the Japanese capital Tokyo. This same area also gave this double-7" (two jukebox style black vinyl 7"'s) it's name. The single comes in a luxurious gatefold sleeve featuring stylish photos of Maki (who still looks as young as in the heydays of Pizzicato Five) with an insert printed on glossy paper with the lyrics (mostly in Japanese) and more photos of Maki. The subtitle of the single is that of the lead track, 'Baby, It's Cold Outside', and this song is exemplary for the theme of this single: winter. It was released on December 27, 2017, so two days after Christmas, and is more a seasonal (winter) record than a Christmas record. Two songs have English titles - the title song and the B-side of the second single, 'Winter's Tale' - not the David Essex song nor the Queen song. The two songs with Japanese titles translate as 'Winter Concert' and 'Winter Starts', so it is pretty obvious that this is indeed a winter record - add to this falling snowflakes on the cover photo and the winter clothing Maki is wearing, and the picture is complete. 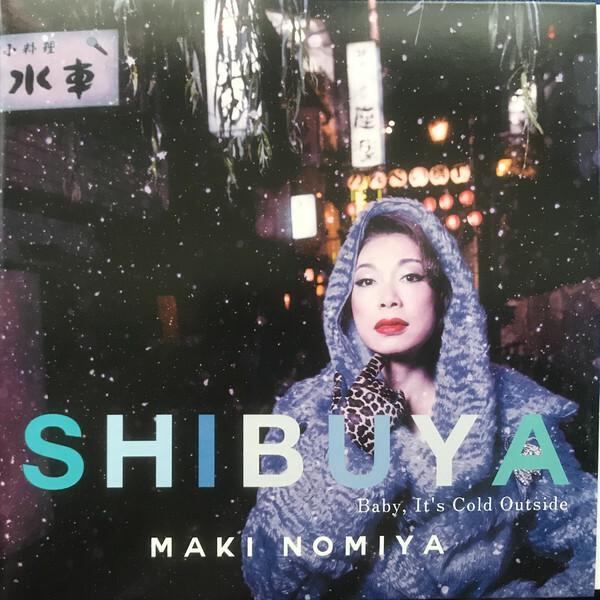 'Baby, It's Cold Outside' is a duet song, and Maki sings it with Ken Yokoyama, the vocalist/keyboardist of Crazy Ken Band, who is also a songwriter. Two of the three other songs are also duets - 'Winter Starts' with Masayuki Suzuki, a former member of the early 1980s black faced Japanese doowop group Chanel, later a solo artist, and 'Winter's Tale', that Maki sings together with Hiroshi Takano, who was both active as a solo artist and as a member of the group pupa. On 'Winter Concert' and 'Winter Starts', backup vocals are done by acappella group Smooth Ace. All four songs are covers. Musically, it all sounds a lot like Pizzicato Five - polished, poppy, with the sweet sounding somewhat girlie vocals of Maki, and very stylish. All four songs also appear on Maki's holiday album, that was already released in October, and that included some genuine Christmas songs, like 'The Bell That Couldn't Jingle' and a song called 'Fun Fun Christmas - Maki Nomiya's Tiny Magic De Paris'. Sunny Day Service may not be as well-known as Pizzicato Five was, at least not outside of Japan, but it is also a band with a long history. The band formed in 1992 and released several albums with alternative rock, before disbanding in 2000. Sokabe Keiichi, the vocalist/guitarist continued to make music, and in 2008, the band got back together, with original member Tanaka Takashi on bass and drummer Harushige Maruyama. Since getting back together, the band released several albums and also released some 7"'s on the label Rose Records, including a single titled クリスマス, which translates as 'Christmas'. The single comes in a sleeve that has a picture of a girl in a red dress with her head stuck in a mask that resembles some sort of prehistoric animal skeleton head, and the date of 12 25 '17, as the date as when this photo was taken. The photo is related to the video that came with the A-side of the single, also titled クリスマス, and subtitled '-white falcon & blue christmas- remixed by 小西康陽'. That is, Konishi Yasang, at least, according to Google Translate. The video is more a mini movie than a music video, as it is 9 minutes long, and features a boy and girl who seem to have some relationship problems and who, literally, stumble into the girl with the skeleton animal mask. The song starts 3.30 minutes in the video. The video is a sequel (or maybe better: remix) of the - also 9 minute long - video of the original version of Christmas, that features the same girl in the red dress and boy and girl. The song, nor the original nor the remix, does sound very Christmas-y, although Sokabe does sing something that sounds like 'Christmas' a lot of times in the chorus. Unfortunately, I don't have the slightest idea what the lyrics are about. 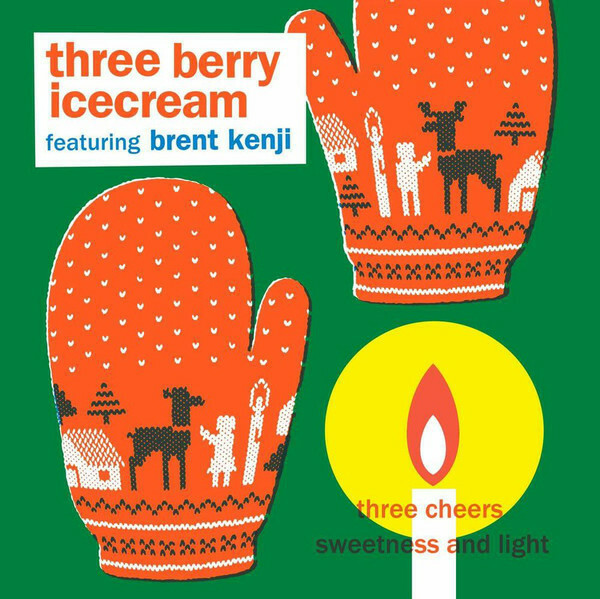 Without doubt the most Christmas-y of all 2017 Japanese Christmas releases is the single by Three Berry Icecream. 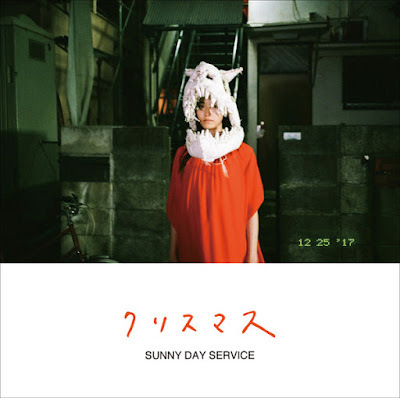 Stuck in a very seasonal looking sleeve, the Japanese tweepop group of accordionist and vocalist Mayumi Ikemizu (formerly singer of BRIDGE), is joined on the A-side on vocals by Brent Kenji of Friedrich Sunlight and formerly of Skypark, The Fairways and The Young Tradition. Although Brent is only singing on the A-side, he wrote the lyrics of both A- and B-side. The lyrics of the A-side are a celebration of Christmas joy ('let's go sledding hey! / 'cause the bells, the bells are ringing our names / aren't you ready for some fun and games / put your mittens on and join the snow parade'), while the B-side lyrics are not really Christmas-related, although, with some fantasy, they could be interpreted as New Years-lyrics, as they are about making a new start. Musically, both songs are typically feel good jangling twee pop, with Mayumi's accordion adding some melancholy. The other four Christmas 45s are released on labels from all over: Spain, Denmark, the UK and the USA. The rather strangely named MFC Chicken was formed outside a poultry shop on the Holloway Road in London, when newly arrived Canadian saxophone player Spencer Evoy met bass player Bret Bolton, who happened to live above the chicken shop in front of which Evoy was playing his saxophone. The shop is long gone, but the band that named itself after the shop is still playing (although without Bolton nowadays) 'real rock & roll music with the saxophone' and 'singing about fast food and broken hearts'. 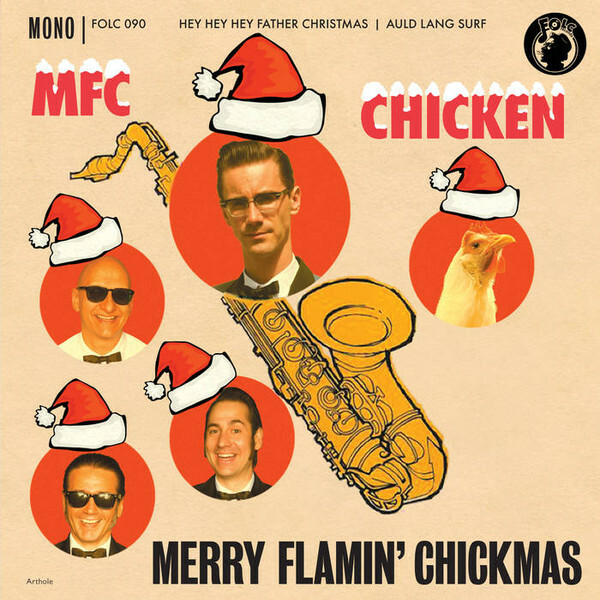 Their Christmas single Merry Flamin' Chickmas' was released on Spanish label Folc Records and has two Christmas songs: Father Christmas and Auld Lang Surf. The A-side is not a cover of the famous Kinks song, but a garage rock & roller in which Spencer complains that Father Christmas hasn't brought him any presents, and denies that he has been naughty, as he only was trying to have some fun, that, true involved 'women and a little bit of booze'. With a saxophone solo that sounds like 'Santa Claus Is Comin' To Town' during the instrumental break, the song is as much garage rock as rock & roll. The B-side is exactly what you would expect of a song called 'Auld Lang Surf': an instrumental surf version of 'Auld Lang Syne', in the style of those early 1960s surf bands that not only had one or more guitars, but also a saxophone. The 7" is very limited, only 50 copies, so get one soon if you don't want to miss out on this rockin' Christmas single. You can get the single and listen to the songs at the Bandcamp of Folc Records. 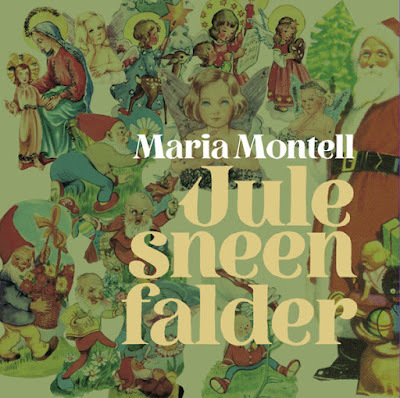 Maria Montell is a singer from Denmark. She is already around for some time - her first single is from 1993, her first album from 1994. 'Jule Sneen Falder' ('Christmas Snow Falls') is her first 7" single and the first Christmas song she has ever recorded. It is a very festive single. The front cover has many Christmas-related cartoon figures, the single comes on green, red or white vinyl and the song itself, a pop ballad, has Christmas bells and sounds quite nostalgic. Maria co-wrote the song with Søren Rasted (of Hej Matematik) and Carsten Skov (also the producer of the song). According to the promo talk, the song was inspired by Phil Spector's Wall-Of-Sound and talks about taking care of each other. The B-side of the single is a 'karaoke' version of the A-side, i.e. an instrumental version. You can listen to the song on the website of Maria and also order the single there - if you live in Denmark. Postage for international orders is extremely high, I hope they will offer a cheaper option one day, as it is a nice single. This is a record with a story. A Christmas story. In 1995, singer Dave Hansen was invited by the band Beat Rodeo to play a Christmas song with them at The Ludlow Street Café, Lower East Side, New York City. Knowing that the band knew the murder ballad 'Psycho' (written by Leon Payne), Dave got the last minute idea to turn it into a Christmas song. He wrote the lyrics in a cab on his way to the show. After being invited by the band to join them on stage, he first sang 'Blue Christmas' and then called out 'Psycho! ', to which the band objected, as they pointed out it was not a Christmas song. But Dave managed to convince the band to start the song, he took out the piece of paper on which he had written the lyrics and the crowd went crazy. And now, many years later, Dave has recorded the song with his band The Western Caravan, a band that, according to their website, is the best-known, most booked Western Swing band in NYC. On the recording, only five members of the band were present, besides Dave, all veterans of the country music scene, that have played on many records through the years: bassist Steve Alcott (Bill Krichner, Don Byron, Jim Allen), drummer Dave Sonneborn (Blackwater), fiddler Bob Mastro (Mary O'Dowd, Leon Redbone, The Dixie Bee-Liners) and guitarist John Widgren (Joe Taylor, Jim Allen, Jonathan Coulton). The song itself, retitled to 'Psycho Santa' is not about a psycho Santa, but about a psycho who gets a visit from Santa Claus, and doesn't want to let him go. 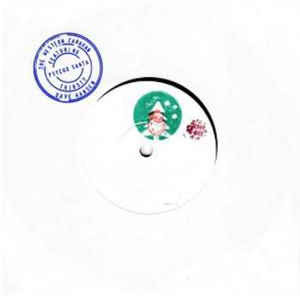 It was released as by new UK label Stolen Toy, as an one-sided white label stamped 7". Unfortunately, the song is not available online, but the single is well worth getting! You can find it online in most of the UK indie shops/mailorders. To be honest, I am not sure if Eastern Star by vocalist Fikir Amlak and producer Brizion really is a Christmas song. Personally, I do associate a song about a star that is high in the sky and people who follow that star to worship, on a single released late November, with Christmas, but who knows, maybe those following the star were not on their way to worship a baby in Bethlehem, but an emperor in Ethiopia. After all, this is very much a reggae record. Although one with a very modern (electronic) sound, much more 2017 than 1977. Fikir Amlak (Ethiopian for 'Jah Love'), who's real name is Andres Estrada, is originally from Puerto Rico, but moved to Santa Cruz, CA in 2002, to form a musical collective of conscious Rastafari's to promote the message of Haile Selassie all over the world. 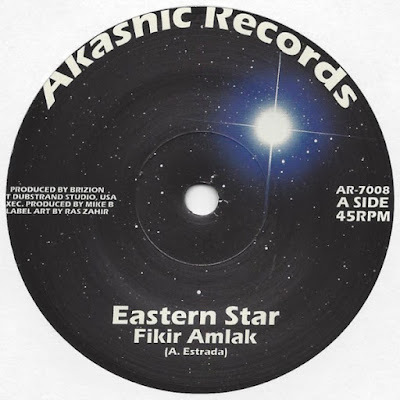 Fikir Amlak was first a band, with Andres as singer, but is now basically just Andres. Brizion is a reggae producer who is already active since the mid-2000s, is based in San Diego, California, and has worked with a range of vocalists over the years. The single can be ordered from the Iroots Bandcamp-site, where you can also listen to the song, and decide for yourself if Eastern Star has anything to do with Christmas or that is just another song praising Haile Selassie. But even if it isn't, I still think it's a cool song that won't out of place on a Christmas compilation that is a little bit left-of-center.